Taking the leap to become a beauty photographer can be intimidating; so much goes into just one shot that it can be a little difficult to wrap your mind around it all. 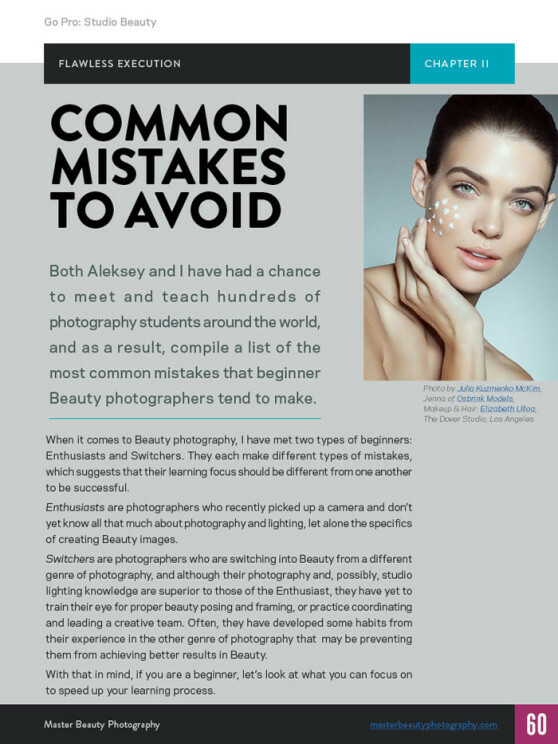 Thankfully, Julia Kuzmenko McKim, one of the most highly-regarded beauty photographers in the industry, has brought an comprehensive video and written guide into shooting beauty photography that will take your images from ordinary to exceptional. I was able to get a copy to view and share my first impressions of the guide. Before I dive into the video content, I do want to go over the written part of the guide. The PDF is a whopping 104 pages of beautifully laid out content that can be viewed not on just your desktop, but with any tablets that support the PDF format. I viewed the guide on both my full size iPad and my iPad mini, and both looked great. I really recommend to read the guide before you watch the video content. The video content is meant to view sporadically throughout the guide, and if you skip the PDF and go straight for just the video content you’ll be missing out on a great amount of information within this tutorial. Starting off with the basics, Julia goes over fundamentals like what dynamic range is, using different light modifiers to enhance an image and even using them to help correct a model’s skin texture. What I found particularly useful was when Julia teaches how to reverse engineer other photographers’ photographs to figure out how to shoot the image in question. She walks you through the process of reading light by identifying light modifiers in the model’s catchlights, reading depth of field, rim and fill lighting and even shadows caused by the photographer’s main light. This is definitely useful if you use other people’s work as inspiration for your own. She also explains throughout the tutorial what equipment you should consider using to get the desired look that you want out of a shoot, including the pros and cons of using prime lenses versus zoom lenses. Another thing that I believe many amateur photographers tend to overlook is building a proper team to help you with your shoot. She explains how to build such a team for both test shooting and collaborative portfolio work. A great quote she says is “Your team is always only as strong as your weakest team member.” She shows you what to look for in a stellar team and how to attract other industry professionals and the models that you will be shooting. She also gives some great tips on using platforms such as Pinterest to help share your creative vision with your team to make sure everyone is on the same page. The lighting portion of the tutorial is jam-packed with lighting setups from your traditional beauty looks, to some more creative lighting with gels and mixed lighting with reflective fabrics and accessories. 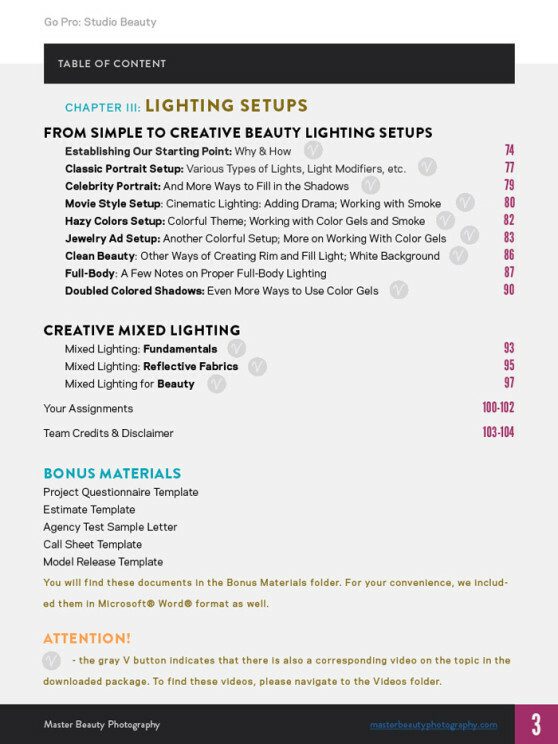 The tutorial also covers how to shoot jewelry campaigns and how to mix colored lighting effectively. Julia takes her time to explain all of the setups and even points out common mistakes that you might make during shooting. Using both easy to read diagrams and voice over instructions along with example photos it’s very easy to follow along with the lighting portions of the tutorial. The diagrams and example photos are also included in the written guide. She reassures the viewer that practice makes perfect which I know helps me from feeling overwhelmed with such an abundance of information. I do want to add that this tutorial does not include anything retouching or post-processing related, but if you follow the advice given within the tutorial your post processing will go a ton smoother and faster than someone who may be trying to wing the shoot on just general knowledge. Retouching Academy of course has other tutorials based on just post-processing your images which can be found on their website. I only have one nit-pick for the tutorial and even though it’s such a minor thing I figured I would go ahead and mention it: Throughout the tutorial you see Julia’s co-writer Aleksey Dovgulya in several shots speaking to the camera giving instruction. His voice has been replaced with Julia’s voice over which is fine, and I am assuming that it’s the same information that Aleksey is giving, but the curiosity of wanting to know what he’s saying can be a little distracting, even if it’s in his native tongue of Russian. Again, this is such a minor nit-pick that it really shouldn’t affect whether or not to consider the tutorial. I will say that after reading the guide fully and watching the content I can now see how many mistakes I was making while attempting to try out beauty photography. Not just with my lighting or my execution of the shoot, but with my overall approach to beauty photography in general. I can now identify the mistakes I made and hopefully with practice and a good collaborative team to back me up I can start to eliminate them and start producing breathtaking imagery. I highly recommend this tutorial to anyone who is interested not just in beauty photography, but even general portrait photography as the techniques and skills taught within are viable for both mediums. 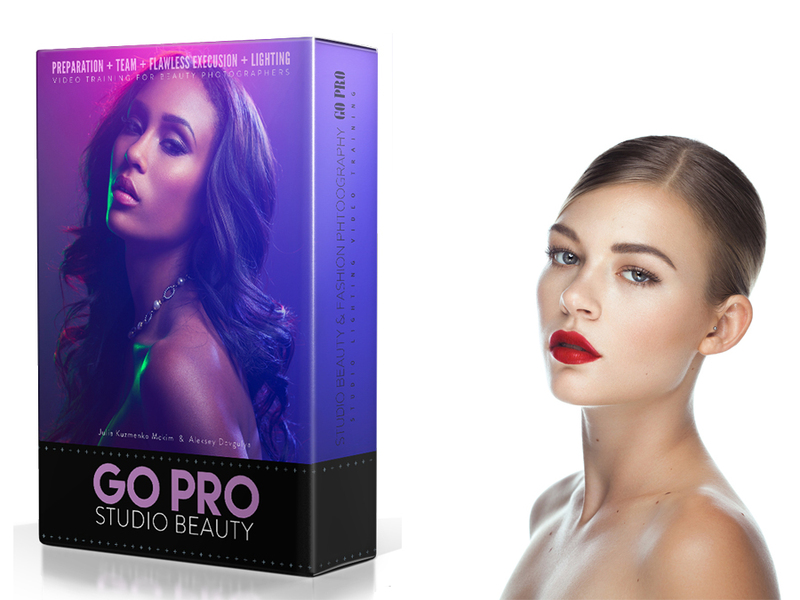 The Go Pro: Studio Beauty tutorial is jam packed with powerful advice, insightful instruction and exhilarating inspiration for both novice photographers and seasoned professionals who want to elevate their beauty photography to a whole new creative direction. You can purchase the tutorial on Julia’s website for an introductory rate of just $169 for the week of its release. After that it will go back to its normal price of $199 which is still half of what other high-end photography tutorials cost. It’s definitely worth the investment if you want to take your photography to the next level. Rebecca Britt is a South Texas based commercial, lifestyle and concert photographer. Talents ranging from portraiture to nightlife, her uncanny talent for diversity is highlighted by the real moments immortalized through her lens. Rebecca also runs the largest collective of EDM (electronic dance music) photographers on social media.When she's not working Rebecca enjoys spending time with her two daughters, traveling the country with her colleagues, playing anything Zelda or Diablo III, and shooting concerts (Electronic Dance Music/ DJs).